Brazil's players celebrate after winning the quarter-final football match between Brazil and Colombia on Friday, July 4. Brazil won the match 2-1 and advanced to the semifinals of the tournament. 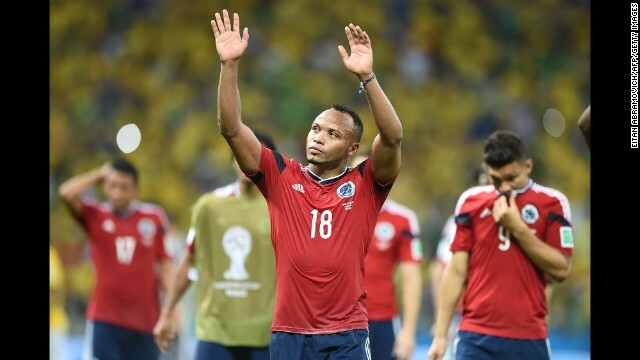 Colombia defender Juan Camilo Zuniga waves after the game. 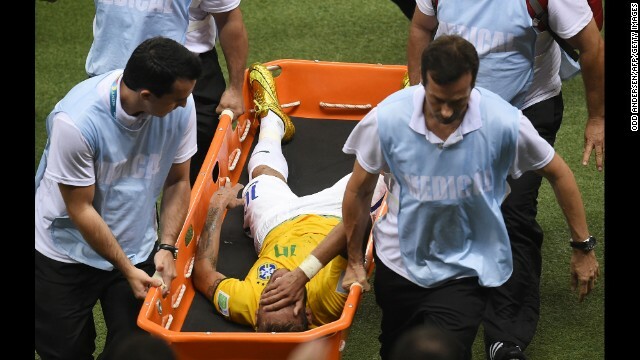 Brazil forward Neymar is carried on a stretcher after being injured following a tackle. Neymar of Brazil is challenged by Juan Camilo Zuniga of Colombia. Colombia midfielder James Rodriguez runs with the ball. Colombia midfielder James Rodriguez, left, shoots and scores a penalty. 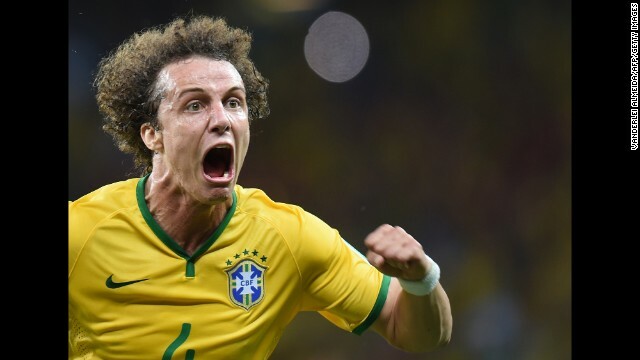 Brazilian defender David Luiz celebrates after he scored on a long-range free kick to give his team a 2-0 lead over Colombia. Colombian captain Mario Yepes (No. 3) tries to kick the ball past Brazilian goalkeeper Julio Cesar. 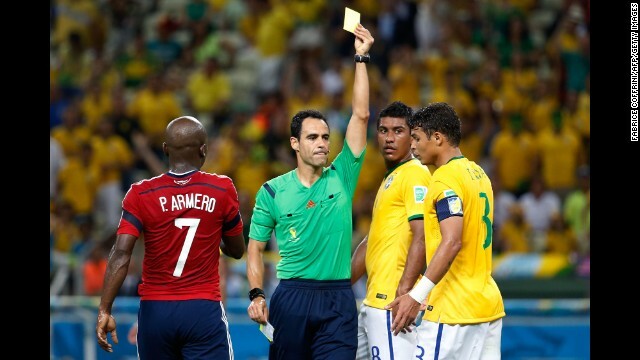 Brazil's Thiago Silva, right, receives a yellow card from referee Carlos Velasco Carballo. 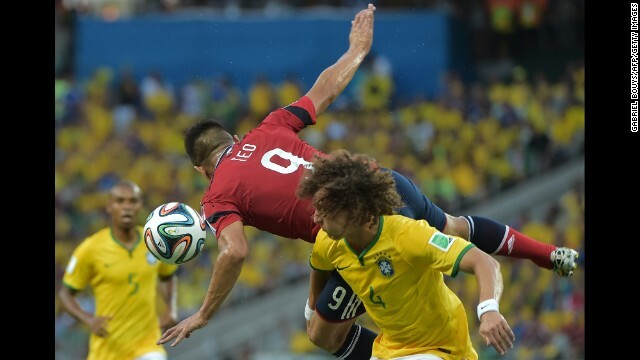 Thiago Silva fights for a header near Colombian forward Teofilo Gutierrez. 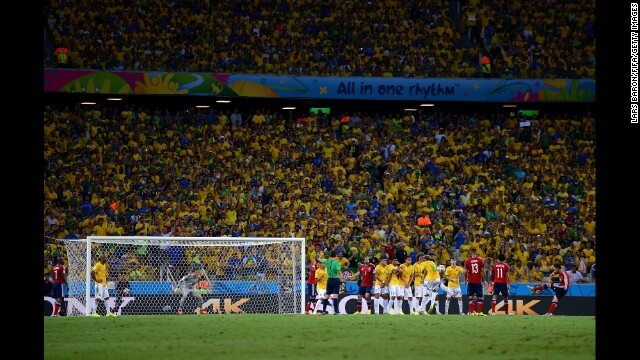 Colombia's James Rodriguez takes a free kick. 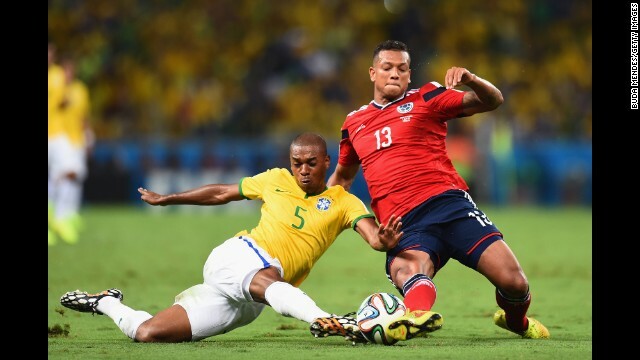 Fernandinho of Brazil, left, tackles Fredy Guarin of Colombia. 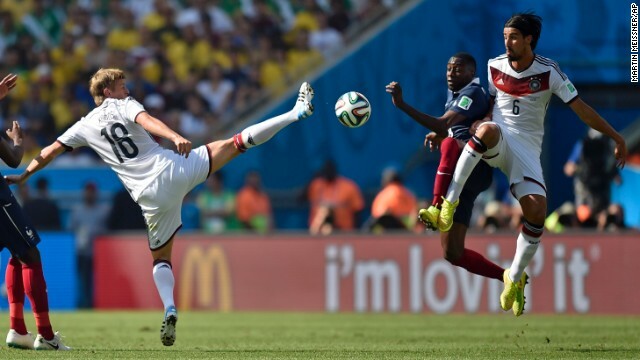 David Luiz, left, and Colombia's Cristian Zapata compete for the ball. Brazilian midfielder Oscar falls down. Rodriguez lies on the field after a challenge. 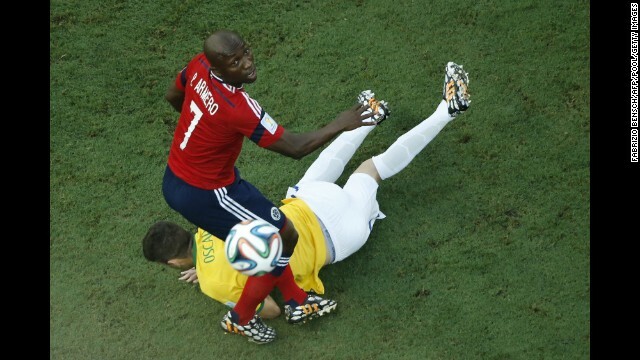 Brazilian forward Neymar heads the ball past Colombian defender Pablo Armero. Neymar prepares to take a corner kick. 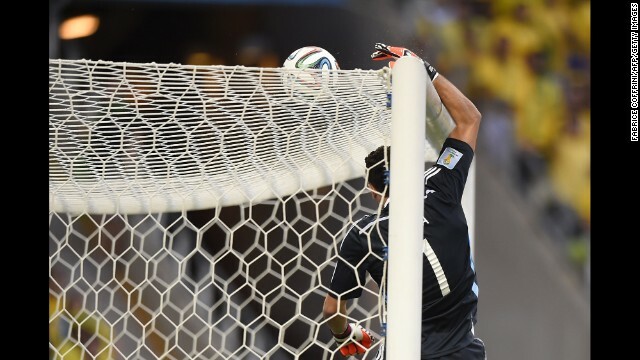 Colombian goalkeeper David Ospina tips a ball over the crossbar. 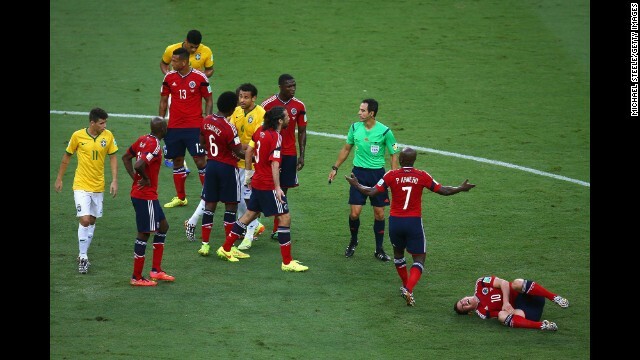 Gutierrez falls over David Luiz. Thiago Silva celebrates after scoring a goal early in the match to give Brazil a 1-0 lead. 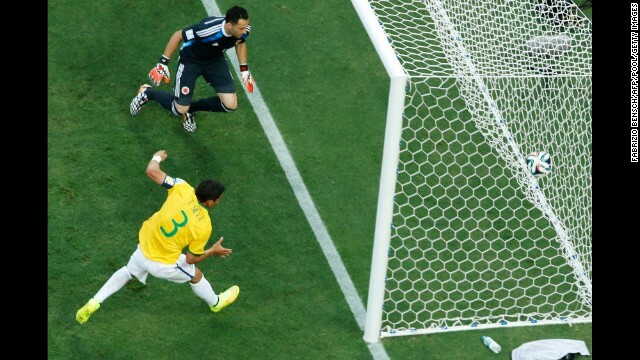 Thiago Silva's goal came on a redirected corner kick. 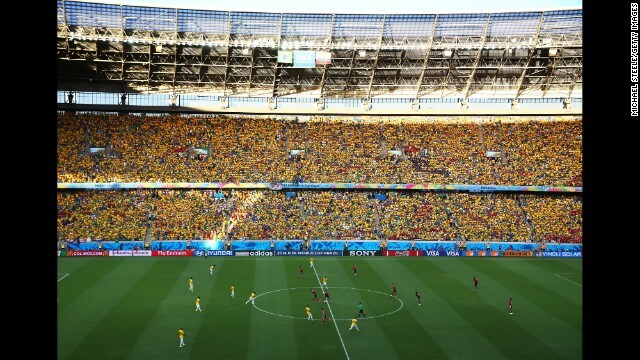 The stadium in Fortaleza was filled with fans wearing yellow, the primary color of both teams. 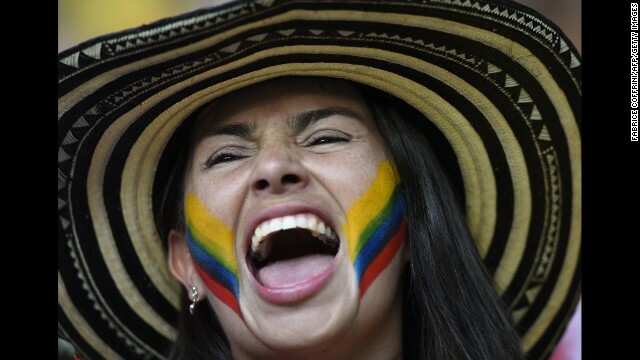 A Colombia supporter cheers prior to the game. 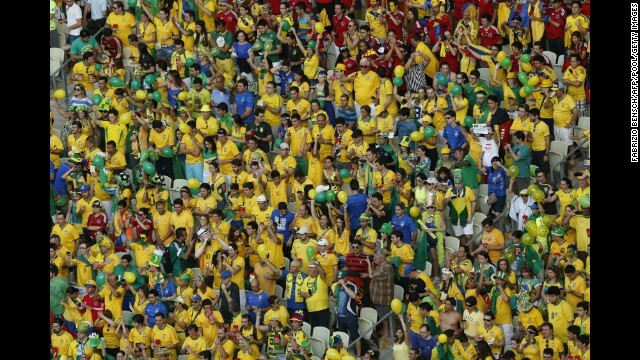 Brazil fans cheer their team. Germany's Bastian Schweinsteiger celebrates his team's 1-0 victory over France in a World Cup quarterfinal match in Rio de Janeiro. 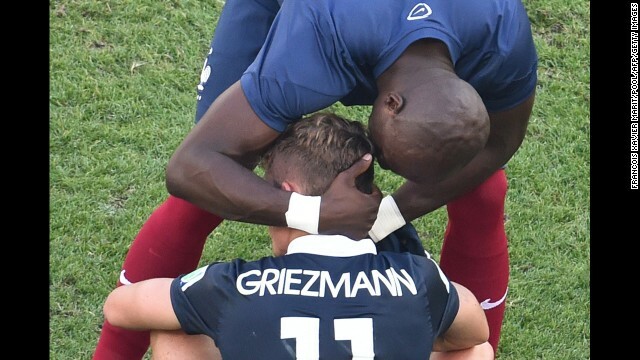 France's Eliaquim Mangala consoles teammate Antoine Griezmann after the match. 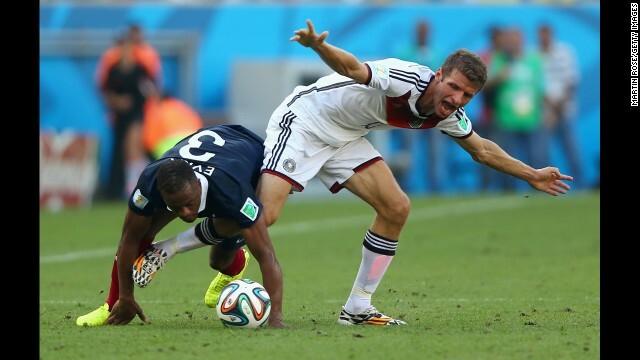 Germany's Thomas Mueller, left, and France's Patrice Evra compete for the ball in the second half. 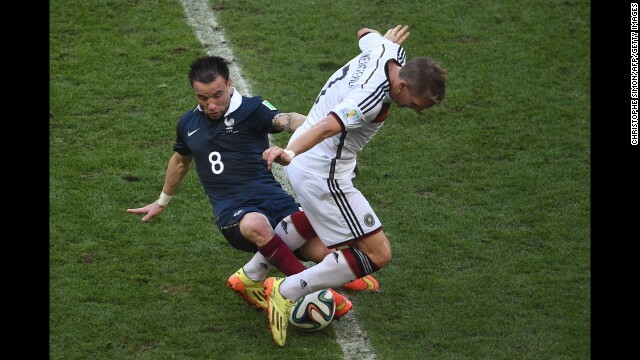 French midfielder Mathieu Valbuena attempts to dispossess Schweinsteiger. 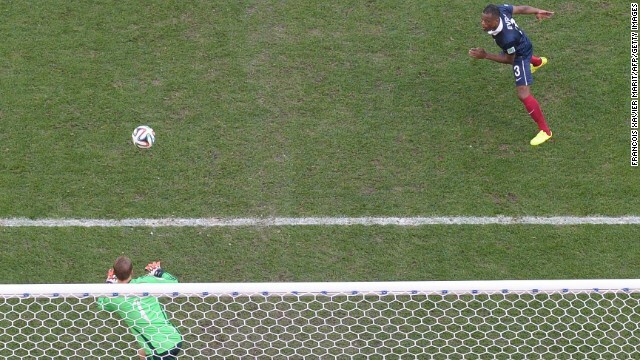 Evra heads the ball toward German goalkeeper Manuel Neuer. 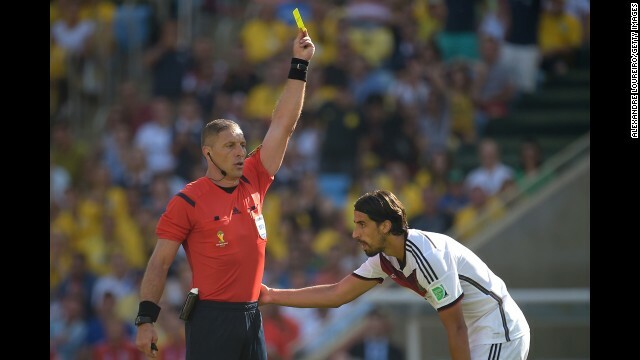 Referee Nestor Pitana shows a yellow card to Germany's Sami Khedira. 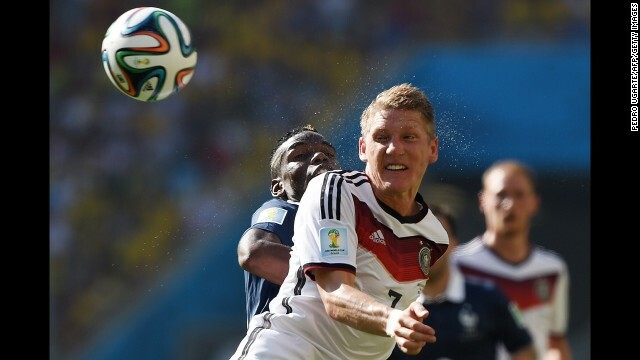 Schweinsteiger and French midfielder Paul Pogba compete for the ball. 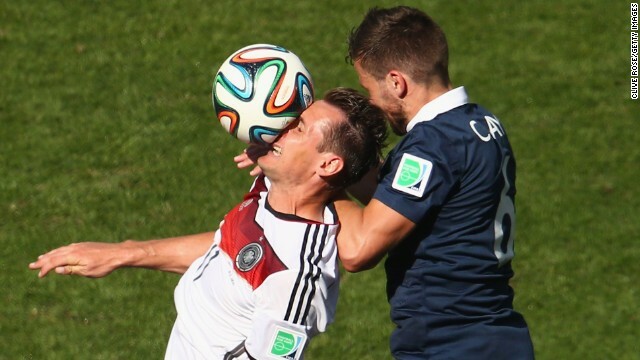 Germany's Miroslav Klose, left, and France's Yohan Cabaye go up for a header. 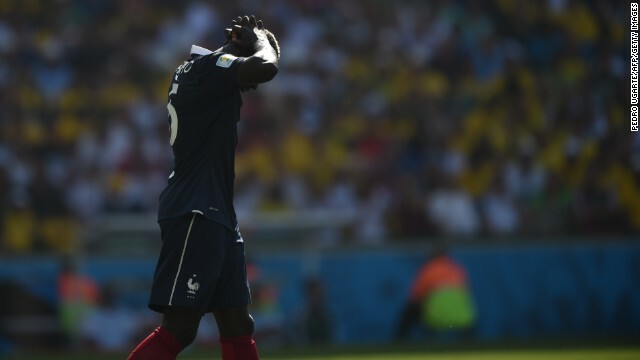 French defender Mamadou Sakho reacts after his team missed a shot on goal. Mueller, center, collides with Lloris, right, and Evra. 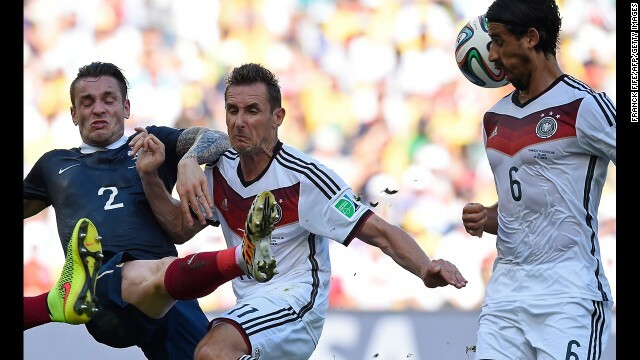 From left, French defender Mathieu Debuchy, Klose and Khedira compete for the ball. Germany's Mesut Oezil takes a free kick. Mats Hummels celebrates with Mueller, left, and Oezil after his first-half header gave Germany a 1-0 lead. 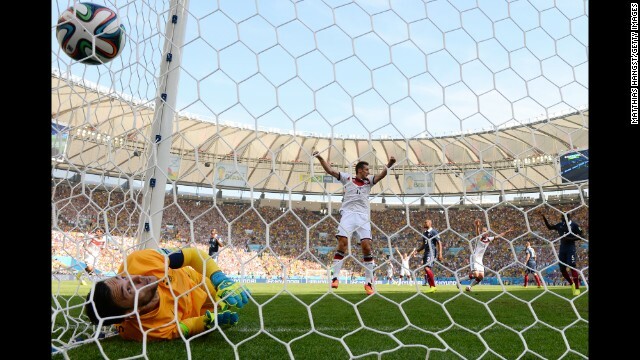 Klose celebrates Hummels' goal as it passes Lloris. 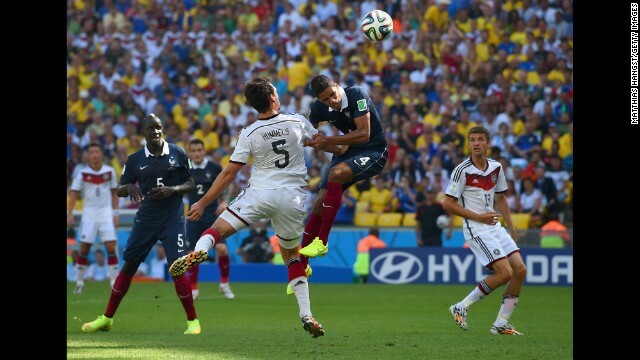 Hummels fights off French defender Raphael Varane to score on his header. 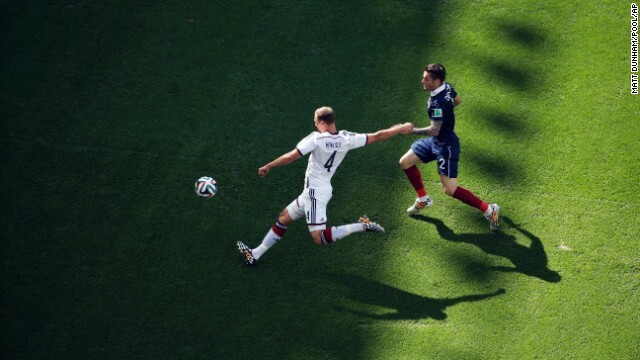 Germany's Benedikt Hoewedes, left, gets past Debuchy. 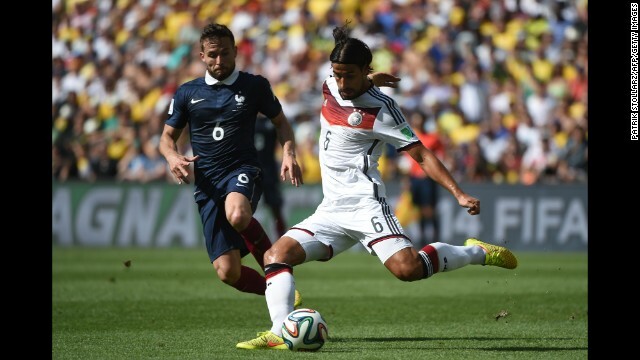 French midfielder Yohan Cabaye, left, looks on as Khedira kicks the ball in the first half. 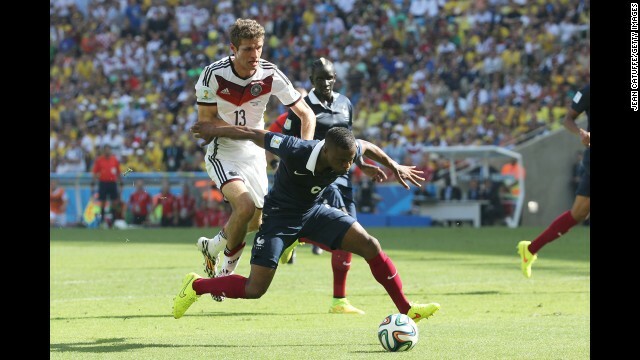 Germany's Toni Kroos, left, and Khedira challenge France's Blaise Matuidi. 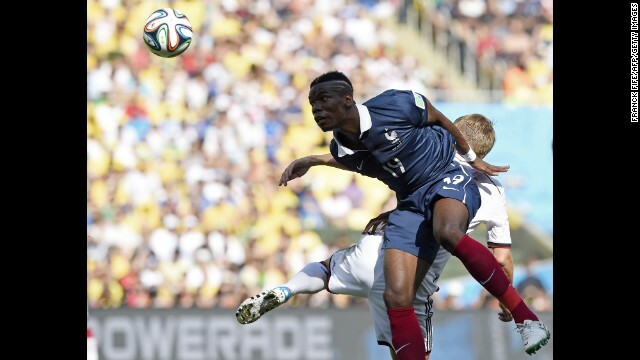 Pogba competes for the ball. 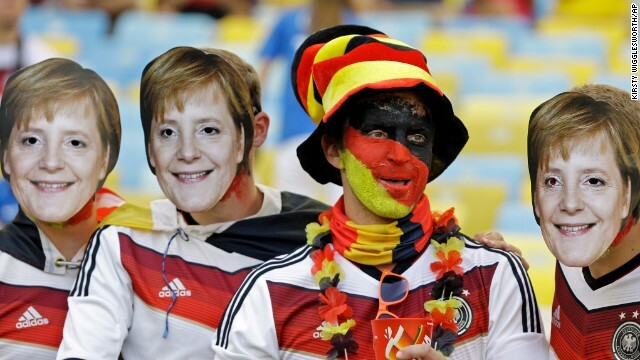 A Germany fan poses with friends wearing masks of German Chancellor Angela Merkel. 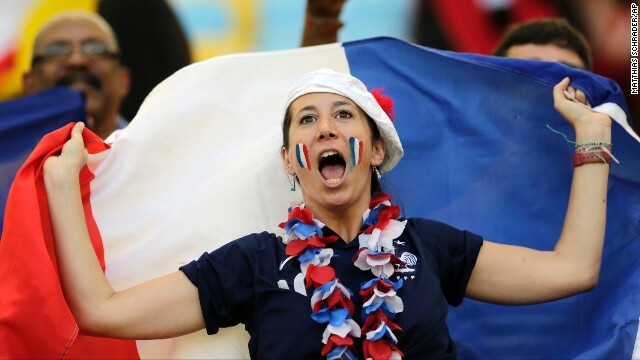 A France supporter cheers for her team. 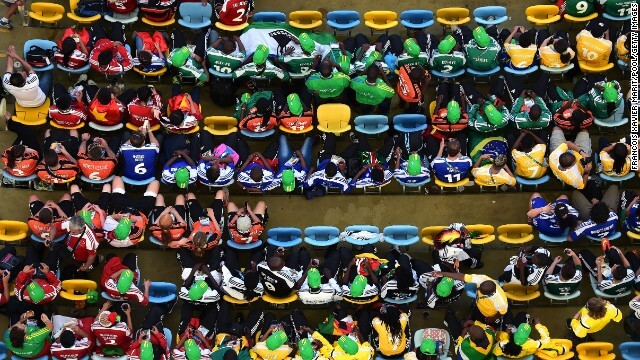 Fans sit in the Maracana stadium before the match. 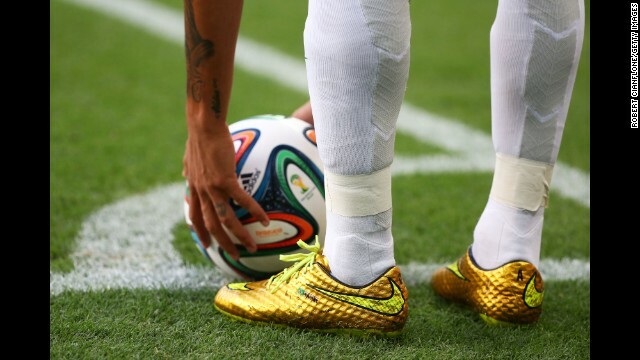 (CNN) -- There were goals, there was choreographed dancing, there were moments of great footballing beauty, but Colombia -- one of the teams to excite most at this thrilling World Cup finals -- is going home after Friday's quarterfinal defeat at the hands of Brazil in Fortaleza. Strikes from the center-back pairing of captain Thiago Silva and David Luiz put Brazil into an unassailable lead and, despite a late penalty by James Rodriguez, the tournament host held on to win 2-1. The home fans' jubilation was dampened, however, by an injury to Brazil's star striker Neymar, who was stretchered off in what seemed like considerable pain in the game's closing moments and will miss the rest of the tournament. The result marks the first time Brazil has reached the semifinal stage since winning the title in Japan and South Korea in 2002, and sets up an intriguing clash against Germany on Tuesday -- a repeat of that year's final. "I think Neymar won't be able to play," coach Luiz Felipe Scolari told reporters after the game, before the team's doctor revealed the 22-year-old forward had a fractured vertebra from being kneed in the back by Colombia's Juan Zuniga. 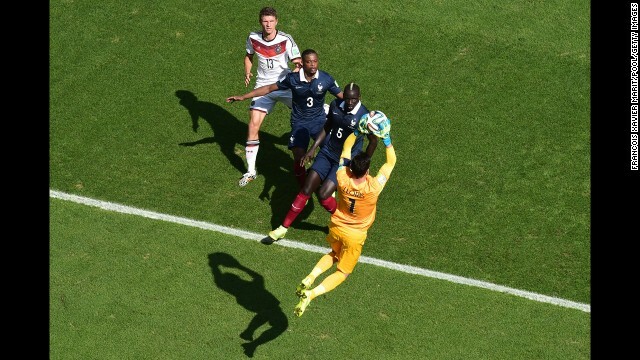 Germany overcame France in the day's earlier quarterfinal in Rio de Janeiro thanks to an early goal from defender Mats Hummels. In the sweaty evening heat of the Estadio Castelao, however, it was another pair of defenders who were the unlikely heroes. Silva opened the scoring after seven minutes, tucking home a Neymar corner with his knee, and the Paris Saint-Germain star was then in thick of it once more at the other end moments later, blocking a shot from Juan Cuadrado. Silva was criticized heavily after apparently refusing to take the sixth penalty in Brazil's round of 16 shootout victory over Chile last Saturday. He was all action here, however. Marshaling the back line and flying into tackles when required. But a yellow card midway through the second half means he will be suspended and miss the semifinal. The Colombia players composed themselves as the first half progressed, coming more into the game despite the rough-house treatment handed out to star player James Rodriguez. On at least four occasions the Monaco star was subject to the stray boot of Brazil's midfield enforcer Fernandinho. Still, the home team continued to have the better chances. Hulk and Fred came close with a snap-shot that Colombia keeper David Ospina palmed away and a header that flashed over respectively. The second half commenced at a far slower pace and there was little of note until Silva was booked for blocking a kick out from Ospina. Colombia did have the ball in the net after 66 minutes as Mario Yepes bundled the ball over the line after a scramble in the Brazilian box. But a linesman's offside flag cut short the nascent celebrations. Moments later there was a goal, although it was to come at the other end. Hulk was fouled by Rodriguez 35 yards from goal and Luiz stepped up to crash a spectacular free-kick beyond the despairing Ospina. It was a remarkable strike that dipped and swerved as it arrowed into the top corner of the net. There seemed no way back for Colombia now. But "Los Cafeteros" were handed a lifeline with 12 minutes to go after goalkeeper Julio Cesar scythed down substitute Carlos Bacca. 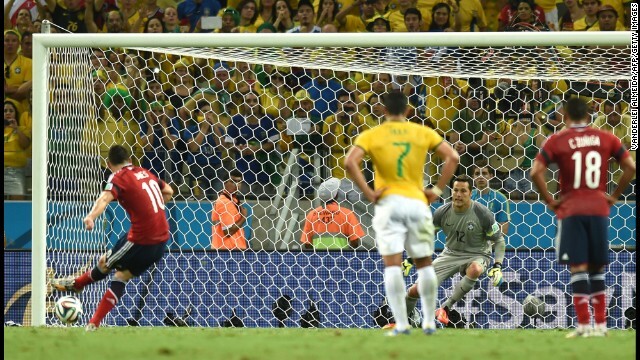 Rodriguez did the honors from the penalty spot, sending Cesar the wrong way to score his sixth goal of the tournament -- two more than closest rivals Neymar, Lionel Messi and Thomas Muller. All of a sudden, the game was back on. Colombia pressed and threw caution to the wind with Yepes playing as an auxiliary striker. But when one final corner kick delivery drifted beyond Cesar's goal in the 95th minute there was time left for little else. 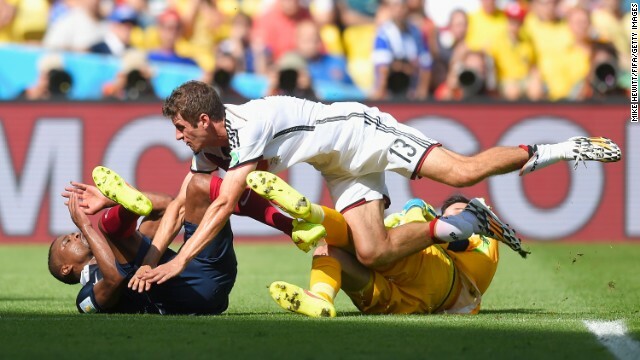 Scolari's side has now overcome the barrier that has proved too high at the last two World Cup tournaments. However, Brazil has not yet looked like a team certain to become world champion for a record-extending sixth time -- as its demanding public expects -- despite having world-class talents like Neymar, Silva and Oscar. Yet somehow they find themselves only a game away from next Sunday's final. Stuttering performances and the occasional stroke of good fortune against Croatia and Mexico in the group stages and once more against Chile has hardly inspired confidence in "A Selecao." Poor showings from the likes of strikers Hulk and Fred have been singled out for particular scorn, although the former put in a solid performance against Colombia. Much was also made in the Brazilian media of 2002's winning coach Scolari -- a man who prides himself on being a father figure to his players -- bringing in a psychologist to speak to his team after many broke down in tears during the national anthems and once again after the dramatic penalty kicks victory over Chile. Was this team soft and mentally weak? Are the expectations of 200 million football-mad Brazilians proving oppressive and too much to bear? "Big Phil" truculently replied earlier this week that journalists who didn't like his methods could "go to hell." Whether said reporters took heed or not, surely lack of maturity is not an accusation that can be leveled against Brazil now. The men in yellow were nothing if not committed, controlled and tactically astute, biting into tackles and closing down with an intensity that ruffled their opponents. Several gestured towards the crowd throughout the contest to increase the noise and crank up the pressure. Colombia, by comparison, can hardly have been accused of being afraid. Jose Pekerman's team has played with a style and confidence throughout the tournament that has been a joy to watch for neutral observers. The delight the entire squad takes in their choreographed dancing celebrations, meanwhile, speaks to the relaxed vibe created by the coach, previously a World Cup quarterfinalist with his native Argentina in 2006. Tellingly, however, Colombia has only ever beaten Brazil twice and never in Brazil -- a run that extends all the way back to 1945 and the formative years of the Copa America. That record will now last at least until the two sides meet next in qualification for the next World Cup in the coming years. Still, today's Colombia players will be heading back homes as heroes, the bright hope of a new generation as the country itself moves on from a dark past. It was 20 years ago this week that defender Andres Escobar was murdered in Medellin upon returning from the 1994 World Cup in the U.S. where he scored a cruel own-goal. Thankfully, those dark days are largely gone and Colombian hopes will be high when the campaign for Russia 2018 begins. 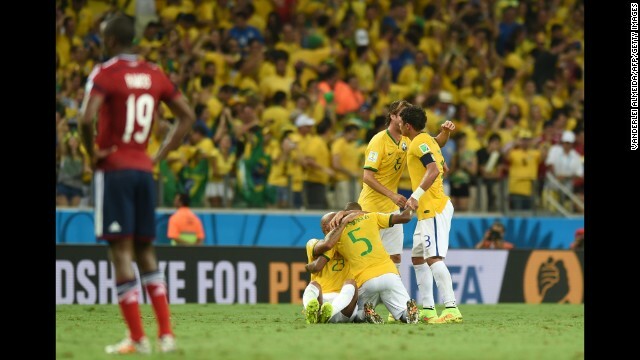 Brazil, however, is still involved in 2014 and will be going to the semifinals in Belo Horizonte.